Is there a bakery lover out there that doesn’t like the aroma of warm birthday cake wafting through their home? Me!! I do!! I love it and anytime I see this scent, I purchase at least a few melts if not a candle or two. I mean – cake!! With sugary frosting!! Yes please! 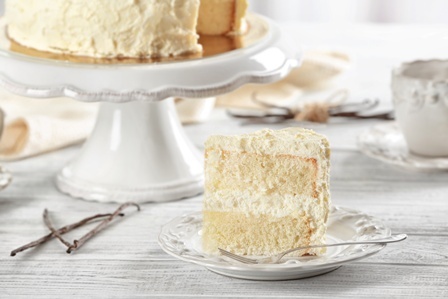 Cream and vanilla combine to make a delicious rich dessert fragrance! First impression when smelling the wax? I thought it smelled more like a vanilla cream rather than cake – actually, like a rich vanilla buttercream frosting. It wasn’t bad, it smelled really good actually. I liked it – a lot!! Now let’s see if the scent stays the same once melting. 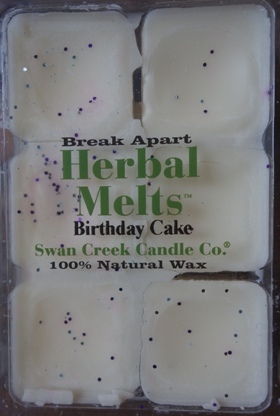 Swan Creek drizzle melts are pretty large so one cube per melt session works great. Once melting, it took a good 20 minutes before I really started noticing the scent and I must say, this was an interesting birthday cake. Up close with my nose practically in the wax, it kind of smelled chemically. Once you move away and simply smell the air, it doesn’t smell chemically at all. I found that interesting. I also want to say, I’ve tried my fair share of birthday cake scents… some smell simply like cake, others more like frosting. Finding a perfect union of both? Very hard. Guess what? I think I found one. Swan Creek’s version had both. I smelled sweet and warm white cake with super sugary buttercream frosting blended throughout and it was beyond yummy! The only negative – the aroma was light. I could only really smell the fragrance if I was close around one of the melters so I think next time, I’ll try melting this scent in a smaller room to see if I get a better result. It’s worth a shot. Which brings me to strength – in a large room, I would rate this scent a 6 out of 10. My guess would be 7/8 in a medium room and 10 in a small. The last two are speculative since I only melted this scent in a large room. In closing, I do recommend this scent if you love sweet birthday cake scents. Just keep in mind it’s lightly scented.